To view your pending transactions through online banking, log in to your account. 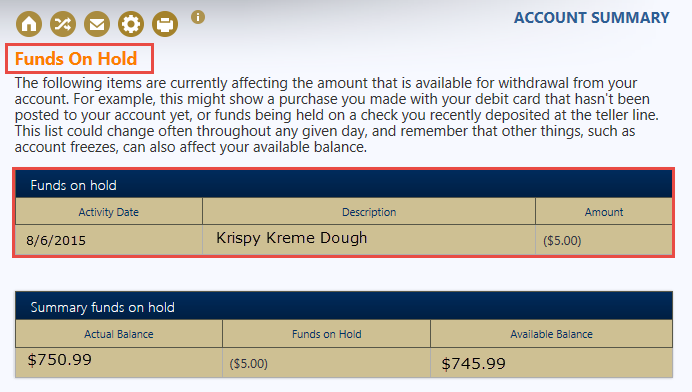 Once logged in, select the the dollar amount under the available Available Balance category of the account you wish to see. You will now see the funds on hold and a summary of all funds on hold. The funds on hold are deducted from your Actual Balance, giving you the Available balance. You can also view your pending transactions on your mobile app. Once you login to your mobile app, select the activity button (1) to view any pending transactions. You will notice that you have pending activity when you see there is a difference in your Available and Actual balance summary (2).